Pay : Pay Band Rs.12000/- to Rs-37500/- Grade Pay Rs.3900/- p.m.
Age: The candidates should not be less than 18 years and not above 44 years on 01.07.2018. There will be 5 years relaxation in age for scheduled caste and scheduled tribe (Plain & Hills) candidates. 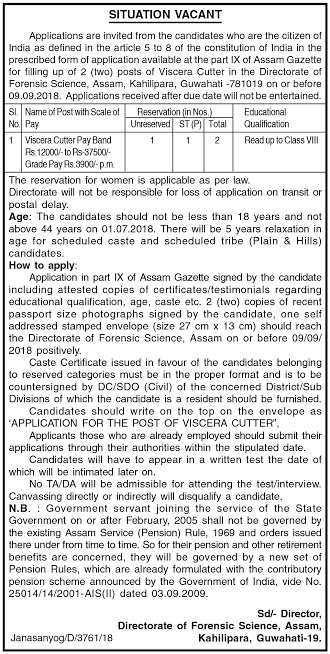 How to apply: Application in part IX of Assam Gazette signed by the candidate including attested copies of certificates/testimonials regarding educational qualification, age, caste etc. 2 (two) copies of recent passport size photographs signed by the candidate, one self addressed stamped envelope (size 27 cm x 13 cm) should reach the Directorate of Forensic Science, Assam on or before 09/09/2018 positively. Candidates should write on the top on the envelope as ‘'APPLICATION FOR THE POST OF VISCERA CUTTER”, Applicants those who are already employed should submit their applications through their authorities within the stipulated date. Candidates will have to appear in a written test the date of which will be intimated later on. No TA/DA will be admissible for attending the test/interview. Canvassing directly or indirectly will disqualify a candidate.